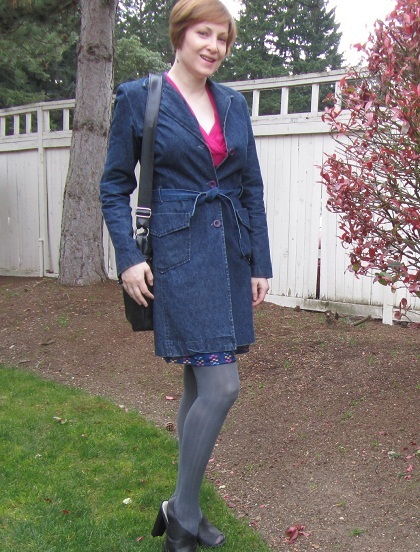 This was one of the looks I featured in my guest post for Be in Style (check it out if you haven’t before). I didn’t feature this outfit in a post of its own though, so even though I took the picture a few weeks ago, I’ll write about it now. You’ve probably seen this coat before. I wear it a lot. It was a thrifted fund from Labels consignment shop in Seattle. I got the skirt at Crossroads Trading on the Seattle Style Bloggers spring meet and shopping outing. It’s fun with tights and isn’t too short to wear bare-legged this summer. Overall, this is a thrifty outfit. And I’ll improve the cost per wear the more I remix these pieces. The skirt has a cute teal, pink, and yellow pattern so I have lots of choices when it comes to choosing a top.